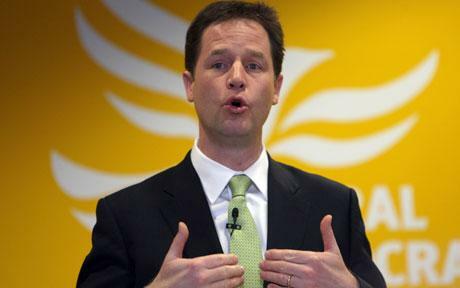 It’s Nick Clegg’s 48th birthday today, so I’m going to start off nicely. I like him, admire him, respect him. To have endured what he’s endured these past five years – a campaign of belittling vilification by the media which bears comparison only to the attacks Neil Kinnock was subjected to – and still to be standing, and sometimes smiling, is deeply impressive. The easy gag about him – the one plied on panel shows passing themselves off as satire – is that he’s weak, put upon, no more than Cameron’s cushion. Just as Spitting Image got it arse-about-face wrong by portraying David Steel in the pocket of David Owen, so does this cliché. Nick leads a party with 9 per cent of MPs in coalition with a party with 47% of MPs. It is not how little he’s achieved in government which should surprise us, but how much. Right, that’s the nice bit over with. 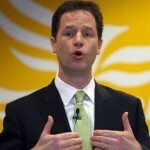 Last year, notwithstanding the above, I called on Nick Clegg to quit as Lib Dem leader. My reasons were quite straightforward: his continuing to lead the party is an obstacle to the Lib Dems staying in government beyond May 2015 if we have the chance to do so. The party won’t vote for a second Lib Dem / Tory coalition with Nick still leading us. And the country won’t buy a Lib Dem / Labour coalition, with Nick undoing chunks of what he oversaw in this Coalition. Quite a few people disagreed with me, told me we owed Nick a far greater debt of loyalty. Fair enough, though in all the responses not one person faulted the logic of my position. But there was another reason I lost faith with Nick last year: his unfathomable decision to elbow Vince Cable aside as the Lib Dems’ economics spokesperson in favour of Danny Alexander, confirmed today. 1. Announce Vince Cable will be the party’s shadow chancellor at the next election. I’m told it’s a done deal that Danny Alexander will get the nod. That would be a mistake. We need a shadow chancellor with clout, utterly secure on the economics, savvy about the politics. As I pointed out a couple of months ago, Vince has done a masterful job of walking “the tightrope of respecting collective cabinet responsibility while signalling quite clearly when and why he disagrees with the Conservatives, most notably on immigration”. Party members also favour – by 63% to 28% – having Vince represent the Lib Dems in the ‘Ask the Chancellor’ debates. I’ve no axe to grind against Danny Alexander. I’ve met him a couple of times, and, like most politicians, he’s both taller and more charismatic than he appears on the shrunken small screen. I’ve no reason to believe he’ll accidentally set fire to his ‘Ask the Chancellors’ podium. He’ll likely acquit himself and the party quite… adequately. But he’s not Vince. Surely, if you’re the leader of a party facing the most difficult election in at least half a century, one in which margins matter – where the result could quite plausibly range from a sub-24 catastrophe to an exceeds-expectations 45 seats – you field your best team? I mean your very best. And on the economy that must mean Vince. There are only two reason I can think of why Nick would choose someone other than Vince to represent the party as its economics spokesperson. Maybe, just maybe, he thinks Danny will do better. More likely, far more likely, he’s taking out 5 years’ pent-up irritation with Vince for not pretending the Coalition’s ‘Plan A’ has actually gone to plan or that it is what a Lib Dem government would have chosen to do. Neither reason reflects well on Nick’s judgement. Agree very much with what you say. I am pro-Clegg and pro his staying as Leader, but I just don’t see the logic or reasoning behind this. If an election is not the time ti put your best foot forward, when is? Expecially such a crucial one. In such circumstances making the public’s most popular LibDem, and one who has done an excellent job in the last five years (noises off aside…), front and centre of the campaign seems to be the only option.